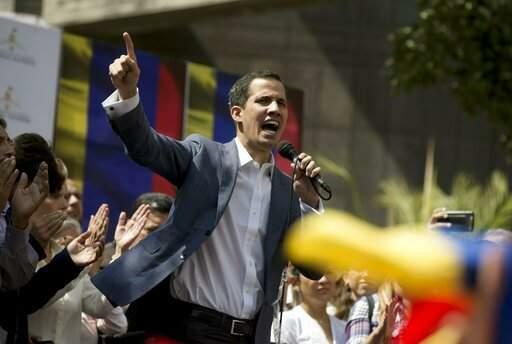 Venezuelan National Assembly President Juan GuaidÃ³ recently addressing supporters after being detained by state intelligence agents. Listen to the Feb. 8, 2019 episode of the South Florida Roundup here. The Venezuela segment begins at 19:20. The U.S. and several countries have recognized President Nicolas Maduro’s regime as illegitimate. They’re instead supporting interim president Juan Guaidó, who recently called on soldiers to allow humanitarian aid to enter Venezuela. The country’s military blocked a highway on the Colombian border that would provide a path for trucks of food and medicine to get to Venezuelans suffering from shortages and astronomical inflation. The evolving political crisis has also turned the Trump administration’s attention to Cuba – what some call the “Cubanization” of Venezuela policy. On the South Florida Roundup, host Tom Hudson discussed these latest developments with Ambassador Carlos Trujillo, the U.S. representative to the Organization of American States. They were also joined by WLRN's Americas correspondent Tim Padgett and Franco Ordoñez, who covers foreign affairs for McClatchy’s Washington D.C. bureau. WLRN: Should other Latin American countries be doing more to isolate the Maduro regime and to help in the humanitarian situation? CARLOS TRUJILLO: They are. If you look at the Latin American continent, besides Bolivia and Uruguay, every other country has recognized Juan Guaidó as interim constitutional president of Venezuela. If you look at Central America, except for Nicaragua and Mexico, every other country has recognized Guaidó as interim president. Obviously the United States, Canada. Forty-five other countries have recognized Guaidó. Colombia this week has canceled visas for high-ranking Venezuelan officials. So the region has really coalesced around isolating Maduro. TIM PADGETT: The military in Venezuela is still obviously the key here. Without the military, Maduro does not remain in power. What more can the U.S. and the international community be doing to convince the military command in Venezuela to abandon Maduro and move to the interim president? TRUJILLO: I think the National Assembly and the interim president offering amnesty to certain military officials is a great start. It starts the reconciliation process within the country. The United States government has made on multiple occasions offers that individuals, who are currently sanctioned or who will be sanctioned in the very near future, have an opportunity to right some of their wrongs and to start cooperating with the democratically elected government. What role does Cuba play in the U.S. response to Venezuela? TRUJILLO: Cuba's currently occupying Venezuela. There are tens of thousands of Cuban soldiers who are currently stationed inside of a sovereign country, inside of Venezuela. Guaidó does not want them to be there. The majority of the Venezuelan people do not want them to be there. They have occupied a sovereign nation through military intervention. PADGETT: Along those lines, it's been hard for the media not to notice that the three-point men really in the Trump administration on the Venezuelan strategy, yourself [Trujillo], Mauricio Claver-Carone in the White House and Sen. Marco Rubio, are all Cuban Americans. What do you say to those who suggest that the real endgame of bringing down the Venezuelan regime is in reality to eventually bring down the Cuban regime? TRUJILLO: As Ambassador Bolton said in his speech in Miami, it's a "Troika of Tyranny." It's not only the Cuban regime, the Venezuelan regime but the Nicaraguan regime. All three tyrants happen to be intertwined. If we are successful, as we will be on our Venezuela policy, the Cuban economy will not be able to survive and hopefully will lead to democratic change.